In 1985 Ron Thompson announced his retirement from conducting ‘ THE TORWOOD SINGERS’ and asked if anyone would like to take the reins/baton. There were no takers at the time but after A while Rosemary Mudge, one of our Altos decided to accept the challenge. At the time she was head of music at Audley Park school, so she had access to some young singers who came to augment the new choir. The choir sang at the inaugural Christmas concert, for the friends of Rowcroft Hospice, at St. Luke’s church Torquay in December 1985, singing as ‘the Rosemary Mudge Singers.’ Rosemary thought we should have a snappier title, so the choir put suggested new names into a hat……. 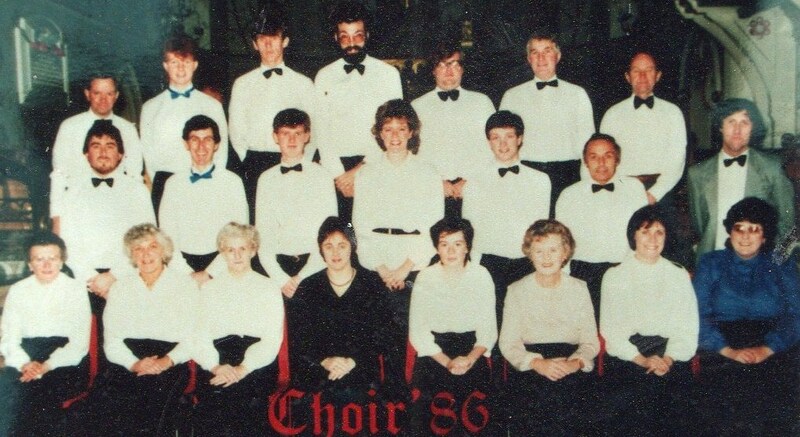 Thus ‘Choir 86’ was born. So our early concerts were assembled from madrigals, ‘Swingle singers’ arranged Bach music, folk songs, motets and anthems and a compilation of songs from ‘Jesus Christ Superstar’ etc. In 1986 & 1987 we were invited to sing at the newly reinstated ‘Holly Balls’ but we discontinued the booking, as by midnight the revellers [not drunken I’m sure?] were much louder than the choir. Soon our year began to take shape, with sacred music at Easter, notably requiems by Faure, Rutter, & Mozart in the early years. Lighter music in the summer; folk songs, madrigals etc. Finally of course Christmas music in December. From the start we have always encouraged soloists from within the choir, such as ‘Sharon & Sue’ singing folk songs & ‘Alison & Leigh’ playing violin duets. As the saying has it ‘what goes around comes around’ to our great surprise and delight, Rosemary, now with a new ‘Penny’ surname became available just as we were in need of a new musical director. As Wyn had hung up his organ shoes after 30 years faithful service we were also in need of an accompanist but the ever thoughtful Rosie had that covered, as she coaxed the lovely Jean Baldey [still in her prime!] to play for us. Not only that but this time around Rosie came with her own very talented musical family who often supply a instrumental ‘ensemble’ to add colour to the choirs’s performances. Rosemary ensures that the choir keeps up to date, at present our most modern piece we are performing was written in 2016.